The Amazon Deal Can Be Stopped! Fund Housing, Transit & Education—Not Corporate Profits! On November 13, Amazon announced that it would put one half of its new headquarters in Long Island City, Queens. Erstwhile rivals Governor Andrew Cuomo and New York City Mayor Bill de Blasio came together to congratulate themselves on winning Amazon’s “HQ2” national beauty pageant. But not all that glitters is gold. In exchange for a promise of 25,000 jobs, Amazon will receive corporate welfare in the form of tax credits and state government grants estimated at nearly $3 billion over 10 years. The estimated cost per job? $48,000 apiece. The shocking giveaway — to attract one of the world’s richest companies to one of the world’s most desirable locations, a stone’s throw from Manhattan — sent a shockwave of resistance through working class communities. Adding insult to injury, 1,500 units of affordable housing as well as a school originally slated for the area will likely be cut if the planned Amazon campus goes ahead. Instead, Amazon CEO Jeff Bezos will get a helipad funded by taxpayers. All this for the richest man in the world, whose company paid $0 in federal taxes in 2017! The fears of displacement, rising rents and homelessness, and no added benefit to the local community are real. Cuomo and de Blasio are promising jobs — but the experience of Amazon in Seattle shows that Amazon doesn’t so much bring jobs as bring high-paid transplants attracted to an urban environment. In Amazon’s press release, the company states that the primary driver of their decision was where they could attract top talent, adding that tax incentives were not a major factor. So why give Amazon the handouts at all? When the MTA is broken and NYCHA is falling apart, we should be taxing billionaires to provide the money we need — not giving it away to them. Why can’t Amazon pay for the 10,000 new homes for homeless individuals and families that groups like Coalition for the Homeless have been campaigning for? Amazon’s benefits will vary based on how many people they ultimately hire. At 25,000 jobs over 10 years, the state would kick in $1.5 billion with the city adding another $1.3 billion, for a total of $2.8 billion in subsidies. If Amazon brings 40,000 jobs over 15 years, the city would be on the hook for $2.3 billion while the state would add $1.7 billion. The total corporate subsidy could be a whopping $4 billion. The benefits given away include both existing corporate welfare subsidies and discretionary benefits that Cuomo and de Blasio specially approved for Amazon. Given that Amazon has revealed its total project will cost about $3.7 billion, the government is giving Amazon around a dollar of break for every dollar it spends! Using rosy estimates, Governor Cuomo has promised a 9-to-1 return on the government’s investment. But this is based on cherry-picked job creation data and knock-on effects that economists believe could be up to 85 percent inflated. No doubt Cuomo is hungry for a winning economic development project, after previous ones like the Buffalo Billion failed to deliver and led to corruption investigations. State Senator Michael Gianaris of Queens has correctly said, “This bad deal needs to be torn up and thrown away.” Gianaris is the second-leading Democrat in the newly elected State Senate, where the Democrats will have a 17-seat majority come January. While de Blasio and Cuomo would like us to believe that this deal is done, there are ways that the legislature can scrap it (explained below). Clearly, powerful sections of the Democratic Party in New York are beholden to Cuomo and big business. We need to build a mass fightback to hold these politicians’ feet to the fire and demand they stand up to Cuomo and block this deal. The memorandum signed by Cuomo and de Blasio with Amazon short-circuits the normal process for approving projects, called ULURP, which provides for Community Board review and requires City Council approval. The hypocrisy of avoiding city input is particularly rich after de Blasio campaigned for two ballot proposals pushing Community Board “empowerment” in the recent November elections! This closed-door process is precisely what Amazon insisted on. Instead of City Council hearings open to the public and liable to be disrupted, Amazon will quietly submit its General Project Plan (GPP) to the Empire State Development Corporation, a body on which seven of nine directors are appointed by the Governor with the consent of the Senate, before the GPP heads to the Public Authorities Control Board for final approval. Mayor de Blasio’s deputy mayor for housing and economic development (and former Goldman Sachs executive) Alicia Glen defended the undemocratic process by saying, “The governor and the mayor were both elected by overwhelming majorities.” But were they really elected to give Amazon $3 billion in corporate handouts? Glen’s out-of-touch remarks underscore that there is nothing democratic about this deal: it was negotiated in secret for nine months during Cuomo’s re-election campaign, and then revealed just days after New Yorkers voted. City Council leaders have floated the idea of launching a lawsuit in protest of this process. The state legislature, however, has more tools to push back. The most immediate action required is to demand the New York State Public Authorities Control Board (PACB) reject Amazon’s General Project Plan (GPP) and the $505 million in cash grants contained in the state’s economic development funding package. The PACB has rejected shady GPP deals before — most memorably in 2005, when the board killed then-Mayor Michael Bloomberg’s bid for a $2 billion stadium on Manhattan’s West Side as he tried in vain to bring the 2012 Olympics to the city. There are five people on the PACB — one member representing the Governor and four others recommended by the Majority and Minority leaders of the Legislature. For money to be approved, decisions must be unanimous. That means Carl Heastie, the Bronx Democratic Party leader in the Assembly, and Andrea Stewart-Cousins in the Senate, can veto the General Project Plan and $505 million to Amazon. If the state has $505 million to throw around, it would be better spent on addressing the growing homelessness crisis than boosting Amazon’s profits. Another possibility is refusing to pass any appropriation for Amazon through the regular state budget process which starts in January. The Excelsior Jobs and Investment benefit at the state level has a cap, but Amazon has been promised over $914 million above it (for more, see this detailed CBC analysis). For starters, the state legislature should visibly refuse to increase the cap to provide Amazon the $914 million promised between 2023-2028. We should link the $914 million savings on Amazon subsidies to additional funding for NYCHA, the MTA, climate change mitigation and more. 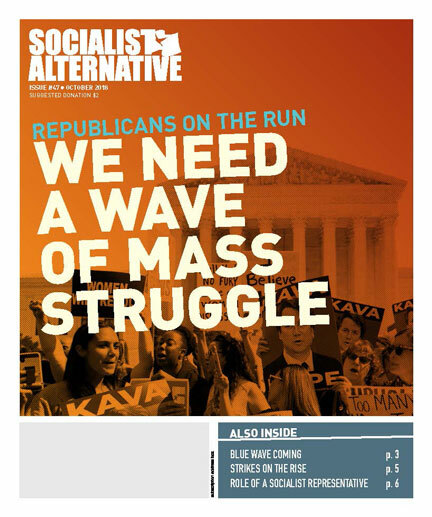 Socialist Alternative believes we should go further and demand the state completely scrap this tax break to big business, and instead pass major tax increases on Wall Street and big business to fully fund transit, education, housing, and a green public works program to create jobs. We should also demand that the city’s major corporate tax breaks are cut. These programs, the Relocation and Employment Assistance Program (REAP) and the Industrial and Commercial Abatement Program (ICAP), are outdated and wasteful. However, ending the programs would require action at the state level due to undemocratic restrictions on New York City’s power to legislate local taxes and tax expenditures. Cutting REAP and ICAP would be an important step toward ending wasteful corporate welfare now and in the future, and place greater resources at the public’s disposal for social services and infrastructure. Demand that Democrats Block the Deal! We need to build an energetic mass campaign across the state with creative and audacious protests to hold politicians’ feet to the fire, and demand they do everything possible to stop this. Working people in the city should register their anger in a trio of non-binding City Council hearings organized on the issue, planned for December through February. We should organize to disrupt phony “community engagement” public meetings on the Amazon deal in Long Island City, Queensbridge Houses, and surrounding neighborhoods. We should protest the PACB when it meets in Albany later this month and next month. There will be an important public forum on December 10 in Astoria that everyone should attend to help build the fightback. Stopping this deal should be linked to fighting for stronger protections for tenants ahead of the expiration of the state rent laws in June 2019 — after all, the Amazon deal is just the latest example of the ability of developers to drive up housing costs. We also need to support the growing efforts of tech workers and Amazon warehouse workers internationally to unionize and fight against low wages, poor working conditions, sexism and racism. Building power in the workplace is critical to fighting the billionaire class. Labor union leaders who have supported Cuomo should stop and should join us to help build a united mass struggle of all progressive and working class organizations against the anti-worker Amazon deal. The unions are the most important organizations working people have, and are a legacy of past struggles against bosses like Jeff Bezos. Together, we should fight to tax Wall Street to fund thousands of good unions jobs to fix the subway, repair NYCHA, and radically improve our education system and public services. Given the widespread anger at the deal, the potential exists for a strong grassroots response. Amazon is already facing growing resistance, including strikes of warehouse workers in Europe. In Amazon’s home city of Seattle, Socialist Alternative and our city council member Kshama Sawant have been at the forefront of building a movement to tax Amazon to fund affordable housing. In New York, the recent election victories of Democratic Socialists of America members Alexandria Ocasio-Cortez to Congress and Julia Salazar to the State Senate, along with the 500,000 votes won by left populist Cynthia Nixon in the Democratic Party primary for New York Governor, underline the growing hunger for an alternative to pro-corporate politics. Salazar, who is far more involved than Ocasio-Cortez with the 5,000 member chapter of DSA in NYC, has a chance to build a socialist-led opposition to Cuomo and the pro-corporate status quo in Albany — and help build a mass movement to lead a real fight against handouts to billionaires. Unfortunately, Salazar recently voted for Andrea Stewart-Cousins for leader of the incoming Senate, and, it seems, without getting much in return. While we agree it’s high time a black woman led the chamber, it’s also a question of what policies the leadership in the Senate will pursue. Salazar missed a golden opportunity to use the leadership vote to put pressure on Stewart-Cousins. She could have made her vote contingent on strong guarantees that the new State Senate leadership would block the Amazon deal, particularly the General Project Plan and the $505 million in state grant money that the PACB will have to approve. Salazar could have also included conditions for action on the New York Health Act and other needed pro-worker legislation. Going forward, Salazar should boldly and publicly demand that Stewart-Cousins and the Democratic Party leadership scrap the handouts to Amazon. If the Democratic Party leadership does not block the deal, Salazar should call for running socialists against them in upcoming elections on the basis of opposing all rotten handouts to big business. As the mask of “progressivism” slips further from the faces of Cuomo and de Blasio, the potential for building a real political alternative — including a new working class party that completely rejects corporate cash and handouts to billionaires — is placed squarely on the agenda. The Amazon deal is a product of decades of pro-corporate development that has transformed New York City into a playground for the rich and increased hardship for the rest of us. Defeating this deal in New York can be a first step toward a fighting for a new society based on meeting the needs of people and the environment, not profits — a socialist world.